In Acts 4, Peter and John are arrested and brought before the high priest and some of his associates. In the previous two chapters Luke has described the ministry of Peter in Jerusalem on the day of Pentecost and just after that time. He and the twelve seem to have gone regularly to the temple for prayer and worship. While they were there, they had opportunity to preach Jesus as the messiah and the gospel of the risen and ascended Jesus to groups of religiously minded Jews who were also in the Temple for prayer and worship. In both cases God does a miracle which demonstrates that the messianic age has begun (the descent of the Holy Spirit and the healing of a lame man), and in both cases Peter’s sermon is based solidly on messianic prophecies found in the Hebrew Bible. Both sermons show that Jesus was the messiah, and that while he was crucified in ignorance, that ignorance will no longer be overlooked, judgment is coming. In each case they have great success with thousands of people believing that Jesus is the messiah and that he will return soon to establish his kingdom. As Ben Witherington comments, it is in this chapter that we “see the beginnings of the power struggle for the hearts of the Jewish people.” (Acts, 189). In 4:8 Peter is “filled with the Holy Spirit” as he addressed the meeting. That Peter is filled with the Holy Spirit is an indication that Luke sees this speech in the tradition of the Prophets of the Hebrew Bible. John Polhill points out that the verb used (an aorist participle of πίμπλημι) is used for “special moments of inspiration,” see Luke 1:15, 1:41, Acts 6:3-5, 7:55, for example (Acts, 143). 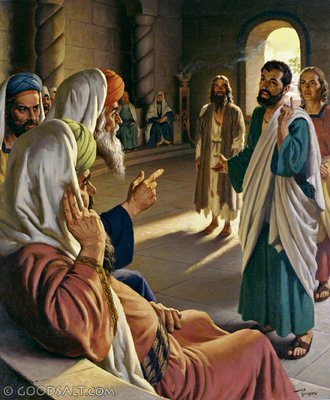 Luke is therefore presenting Peter as giving a prophetic speech like Isaiah or Jeremiah, directly to the leadership of the Jewish people, calling even the High Priest to repent of the sin of killing the Messiah. This “filling with the Holy Spirit” is salvation in a Pauline sense, but rather an enablement to speak boldly before a crowd of people who can (and will) physically persecute Peter for what he says in this brief speech. In what other ways is the activity of the holy Spirit evident in this chapter? Psalm 43 – Vindicate Me! Psalm 43 begins with the writer asking God to “vindicate” him. Verse one uses a legal metaphor common in the prophets to picture the writer and his enemy before God as his judge. 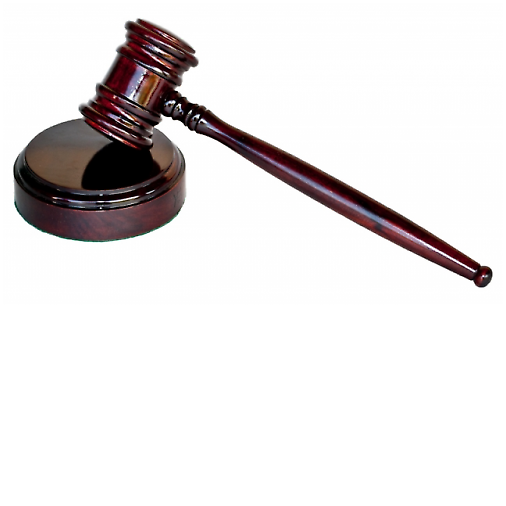 About 40% of the occurrences of the word שפט have God as the judge, nine times the verb is used as a noun to describe God as the “judge.” Sometimes God is called on to judge between two people who are at odds. The phrase “defend my case” is also the language of a lawsuit. The verb ריב and the related noun are both used in the context of someone taking someone to court to sue them. The psalmist is picturing himself going to the city gates of his town and standing before the elder of the town, a king’s magistrate. In order to get real justice, perhaps he has to go to the king himself and plead his case. The psalmist is calling on God to “do justice” in this case. In a human court, the goal is to hear the evidence on both sides of that case and let the judge decide who is “right” and who is “wrong.” If God is the judge, the Psalmist can be assured of justice because God is ultimately just in his nature. Just as in a human court, the psalmist offers evidence against his enemy. First, his enemy is “an ungodly nation.” The noun is simply nation (גּוֹי), although in the context most translations render the word as referring to non-Jewish, pagans or heathens. In the next Psalm, for example, the word is used for the nations the Lord drove out of the land (44:2). Second, they are not faithful . One of the cornerstone virtues in the Hebrew Bible is faithfulness(חָסִיד). The word does not mean “full of faith,” as if it is a synonym for “a believer.” The idea of faithfulness in the Hebrew Bible is an action, one “does faithfulness.” The word is frequently used to describe those who abuse the poor and needy, to be “unfaithful” to the covenant (Mic 7:2). Third, they are unjust. The noun מִרְמָה has the connotation of being a fraud, a trickster. The writer’s adversary tries use some sort of subterfuge to get his way. The word describes Jacob stealing his brother’s blessing (Gen 27:35) and the actions of Simeon and Levi when they made a false covenant with the king of Schechem (Gen 34:13). Micah 6:11 uses the word to describe dishonest weights, which look like the real thing but intend to steal from the unaware. The word is among the many things listed in Psalm 24 which qualifies someone for going up to the Holy Hill of God to worship (someone who does not swear deceitfully). This description of an enemy is applicable during the life of David, either when he was running from Saul or later from Absalom. But it is also generic enough that this Psalm would be a great comfort for someone living outside the land during the Exile – when has Israel not been oppressed by a faithless enemy? This psalm is a promise that God does in fact judge fairly, he will vindicate his people and render justice. 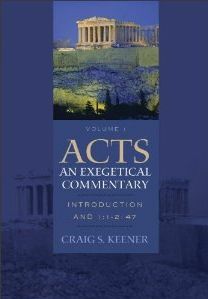 Here is a link to three reviews of Craig Keener’s Acts: An Exegetical Commentary, Volume 1 on Review of Biblical Literature. Keener’s commentary is a a masterpiece, the introduction is at least three or four monographs worth of material. Richard I. Pervo is quite complementary, despite a careful review of Keener’s view of the value of the history of Acts. Even though Keener does not accept Pervo’s view on Acts as Novel, Pervo finds much in this commentary similar to his own thinking. Pervo argues in this review that “every episode should be evaluated for historical worth on its own merits,” rather than resorting to literary or historical theories in each case. For the most part Keener does not interact with Pervo since his work was more or less finished by the time that Pervo’s commentary was released. Joseph B. Tyson looks more closely at Keener’s approach to “Acts as an apologetic historiography.” As he states, it is hard to judge how this will work out in the commentary since the only the first two chapters are included in the first volume. But it is clear that Keener is willing to accept more as historical than most modern commentaries, especially miracles. “to dismiss claims about miracles is a Western ethnocentric, largely academic, worldview and that an unbiased approach would consider their possibility,” writes Tyson. This is not really a surprise since Keener has also written a lengthy defense of miracles. All the more reason for you to invest in Keener’s first volume on Acts! A new update to Accordance for iOS came out this week. Some of the updates are cosmetic, the reading experience is improved with a new theme, using “subtle earth tones, new icons and buttons.” A nine minute video was posted to YouTube highlighting the new features. The video indicates that more people use the iOS version than the desktop version. 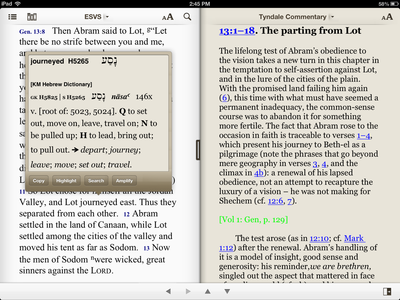 The Free version has an ESVi Bible (for iOS), tagged with Strong’s numbers. Highlight an English word and the Hebrew or Greek word will appear in a floating window. You can “amplify” the word, which opens any Bible dictionary tools you have. The free version opens Easton’s Bible Dictionary. Selecting a word also allows you to highlight a text with a variety of colors or do a basic search for the word throughout the Bible. The free version also includes demos of Hebrew and Greek Bibles. Highlighting a Greek word opens a floating window with parsing information and lexical form, with a gloss from Mounce’s Greek Dictionary. The Hebrew works similarly, although it did not identify all the parts of a word (prefixed prepositions, definite articles, etc.) Only the root is identified and parsed, along with a gloss from the Kohlenberger-Mounce lexicon. One frustration, the floating window goes away after a a short time. Several times it automatically closed before I was finished. If you are looking for a free Bible App for your iPad, be sure to check out Accordance. The writer describes his oppression as being desperate with thirst, longing for water. The opening line is a vivid metaphor for thirst, the writer’s soul thirsts after God “as a deer pants for water.” The verb is rare, only used here and in Joel 1:20, where it refers to animals panting for water after a fire has destroyed all water. But do not think of a dog panting, that is how the animal cools itself. The verb has the sense of craving. When someone “craves” a food, they psychologically have to have whatever it is. The animal is dying for water in the midst of a drought. In this case, the animal is nearly dead and it is desperate for water. The verb in the second verse is usually associated with literal thirst, such as Israel in the wilderness (Exod 17:3). The craving for water here is to meet a basic need or the animal / psalmist will die. But rather than being refreshed by God, the writer drinks his tears day and night (v. 3) The song does not describe why the writer is crying out, only that his tears on constant. The irony is that he has water to drink, but it is undrinkable tears. Because of his desperation, his adversaries taught him, asking where his God is now? This is a common theme in the Psalms, the enemy of the songwriter mocks the writer because he has faith in God in spite of his suffering. There is a hint of the common view that God will reward the righteous and punish the sinner. This is not always the case, frequently in the Psalms the reverse is true, the wicked prosper If the song writer is suffering, it is possible that his enemies are using that as proof that God is punishing him. As with other Psalms of Korah, the writer remembers leading worship in the house of God. The writer is the leader of a procession, going into the Temple. At the very least he is a worship leader (as the sons of Korah were), although there could be a hint of David’s life since he did lead a festive crowd into Jerusalem when the ark was first brought to Jerusalem. If the song writer intends himself to stand for all of Israel, perhaps he is looking back to that kind of joy under David, in contrast to the “present” time of the exile. The “festival” could refer to Tabernacles, which is a feast associated with great joy, recalling Israel’s time in the wilderness, or even Passover, recalling the time of God’s salvation of Israel from their slavery in Egypt. When the Psalmist Remembers the Lord, He Is Overwhelmed by Water (42:6-7). Is this water a positive or negative metaphor? It is possible that verses 6-7 refer to additional suffering. Being caught in raging water is often used as a metaphor for extreme suffering, and these lines are often taken as a reference to the underworld, as if the writer finds himself swept away by primordial chaos into the caverns of Sheol. On the other hand, the writer began by describing his great need for water, and in these verses he recalls the supplies of water in the Land of Israel. At the moment of his greatest need, God overwhelms him with water! The Land of Jordan. This is a reference to the Jordan River, the main river for most of the land, especially from the Sea of Galilee to the Dead Sea. While the river is quite dry today because most of the tributaries are dammed, in the ancient world the river flowed freely. Recall that Joshua was not able to cross the river at flood stage. Mount Hermon. This mountain in the far north of the Land of Israel is nearly 10000 feet (in Lebanon and Syria today). But the reference here is likely not to the mountain itself, but to the foothills. The Hebrew word used here חֶרְמוֹנִים, the plural of Hermon, referring to the whole range of mountains )like “The Rockies”(. 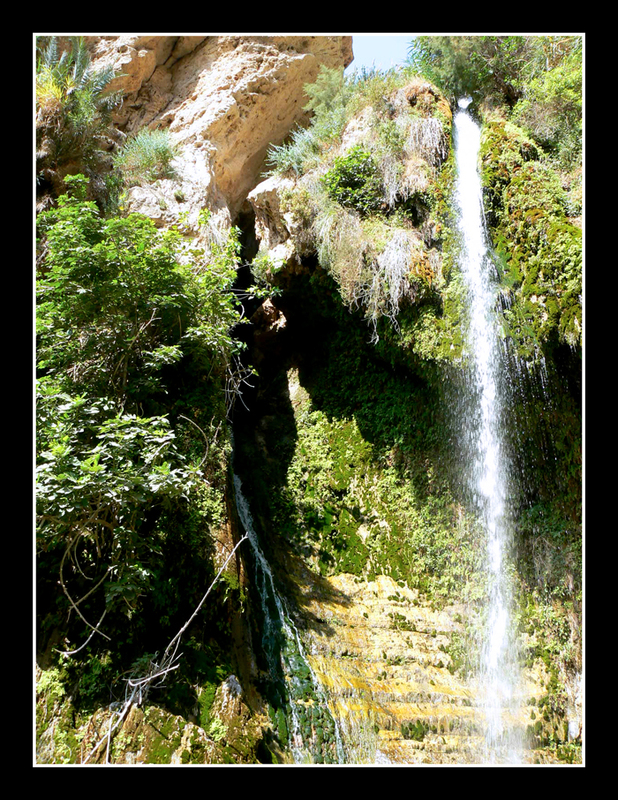 There are three sources for the Jordan which flow south into Galilee, eventually feeding the Jordan River. 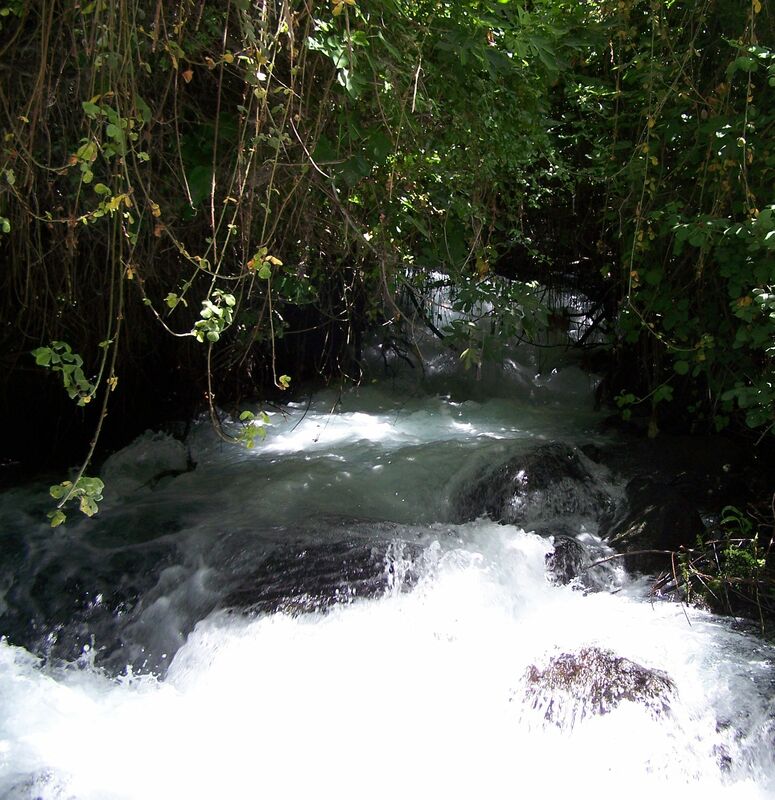 At Dan and Banias in Israel today there is a constant flow of water fed by snows on Mount Hermon. The area is extremely fertile and jungle-like. Mount Mizar is an unknown location, although it is often identified with. The Hebrew word מִצְעָר means small, or “a few,” so it might refer to foothill near Hermon and the sources of the Jordan. But the writer does not simply take a drink to satisfy his thirst, he is overwhelmed by water! When the Lord responds, it is as if he is standing in a roaring waterfall. The word is rare, only used here an in 2 Sam 5:8 (where the meaning is disputed). The Hebrew צִנּוֹר refers to gushing, flooding water, a fast flowing stream, etc. The “deep” is a word which usually refers to the deep sea, the abyss (תְּהוֹם). “Deep calling to Deep” gives the impression of a constant thunderous flow of water. The parallel line is a similar image, waves and breakers sweep over the writer. The first word is used literally for waves in Jon 2:4, and as a metaphor for disaster in Ps 88:8, 2 Sam 22:5, and for God’s strength in Ps 93:4, the second word is far more common and is frequently used to describe restless power. God’s grace is often overwhelming; at the moment the writer felt he was about to die of thirst, he is overwhelmed with more water than he can imagine! The latest Journal for the Study of Paul and His Letters (Fall 2012) arrived today. The theme of the issue is Galatians. The Journal opens with two articles on Salvation History in Galatians, Bruce Longenecker, “Salvation History in Galatians and the Making of a Pauline Discourse,” and Jason Maston, “The Nature of Salvation History in Galatians.” Both these articles argue that Paul does in fact have some idea of “salvation history” in Galatians, Matson is especially focused on Martyn’s classic commentary on Galatians and the more recent contribution by Martinus De Boer on the NTL series. De Boer responds to both articles, arguing that “In his letter to the Galatians, Paul has no interest or stake in saying positive things about the law” (114) nor is Paul interested in “articulating a notion or theory of salvation history with respect to the people of the law, Israel” (105). The issue also contains an article on the Lev19:18 as a Christological witness in Gal 5:14 by Michael Suh. The article argues for an intertextual reading of the verse which “resonates with the larger context of Lev 19” (115). By alluding to the verse and omitting the phrase “I am the Lord,” Paul is able to claim that Jesus is the Lord of Lev 19:18. Todd Still contributes a short article on Galatians as an apocalyptic story, combining the apocalyptic reading of Galatians found in Martyn’s 1997 commentary with the narrative substructure approach found in Hays, The Faith of Jesus Christ. All apocalyptic literature asks., “what time is it,” Paul’s answer in galatians is that it is time to start living out the Gospel. Still comments that Paul is “gob-smacked that the Galatians, who have been baptized into and had ut on Christ (3:27), would even contemplate, much less commit, to living in a B.C. way in an A.D. day” (141). Joel Willitts interacts with the proposal of Matthew Novenson that the word “Christ” in Galatians ought to be understood as Messiah (“Davidic Messiahship in Galatians: Clearing the Decks for a Study of the Theme in Galatians.”) After reviewing Novenson’s Christ Among the Messiahs (Oxford, 2012), Willitts attempts to clarify and extend Novenson’s argument, testing the proposal in an exegetical study of Gal 1:1-4. “When we read Galatians with Davidic eyes,” says Willitts, “Gal 1:1-4 brims with Davidic elements” (160). Novenson briefly responds to Willitts in the following article, although the two are largely in agreement. The journal includes a summary of Stephen Carlson’s dissertation on the Txt of Galatians and a review article of two recent Galatians commentaries (Martinus de Boer and Thomas Schreiner), by Peter Oakes and Roy Ciampa. If you have not subscribed to Journal for the Study of Paul and His Letters, you are missing out on a wealth of quality scholarship. This issue contained seven serious articles on Galatians, 184 pages in all. If this was a volume of essays published by Brill it would cost ten times as much. Biblical Studies Carnival December 2012 Is Here! The Bibliblog Top Fifty is still around, although I have not seen an official month-end post for 2012. I am holding steady at #7, thanks to Jim West and Scot McKnight for not runner the tracker. Hopefully Steve will be able to get many of the blogs which have started this year into the listing, there are quite a few good blogs that are hoping to get into the mix. Jim West is hosting the January 2013 Biblical Studies Carnival at Zwinglius Redivivus, Jim is a wily veteran of Carnivals, so a splendid time is guaranteed for all. I am looking for more volunteers for the 2013 Carnival Season. I have a few set up but most of the year is clear, email me and pick your month! Carnivals are a great way to attract attention to your site if you are new blogger, but more importantly it gives you a chance to highlight the best and the brightest in the world of bibliblogs. If you would like to host a Carnival in 2013, send me an email (plong42 at gmail dot com), or a comment on this post and I can contact you.